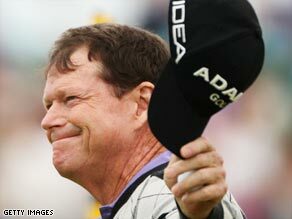 (CNN) -- U.S. golfing legend Tom Watson will seek to become the oldest man to win a major golf tournament when he takes a one-shot lead into Sunday's final round of the British Open at Turnberry in Scotland. Watson has given a vintage display on the Ayrshire links where he won the 1977 British Open. The 59-year-old is on target to win a record-equaling sixth Claret Jug after a strong finish to his third round on Saturday gave him a one-over-par 71 to edge past Australia's Matthew Goggin and England's Ross Fisher. Goggin carded 69 and Fisher posted 70 to be in the clubhouse on three-under 207 as Watson - who shared the halfway lead with compatriot Steve Marino - was a shot behind after conceding three bogeys in seven holes. But the American sank a 30-foot putt to birdie 16 and picked up another shot at 17 before closing with a solid par at the scene of his famous victory over Jack Nicklaus in 1977. He will be hoping to do better than Greg Norman, who last year at the age of 53 led by two shots going into the final round at Birkdale but could not maintain his challenge. "For some reason I didn't feel real nervous out there. I guess serene is again the right word for it. "I made a game plan - normally I've never had a game plan - about the number of birdies and the number of bogeys. I messed up a couple of times, but I didn't let it bother me. It was kind of emotional out there." Of Watson's chasers, Goggin has not won a tournament since 1999, and was only able to take his place in the field as a late reserve. Fisher has the added distraction that his wife Jo is due to give birth - and he has already said he will quit the tournament as soon as she goes into labor. "We'll cross that bridge when we come to it," he said. "I'll be supporting her 100%. I won't be here, I'll be with her, because it's something that I definitely don't want to miss. "It will be a shame. It's been a long week - I've got through three days, she's got through three days. Hopefully I can hang on for one more day, and hopefully she can. To win and then to get back home and to see the birth of our first child would be obviously a dream come true." Englishman Lee Westwood was tied for fourth with South Africa's Retief Goosen on two-under after they shot 70 and 71 respectively on the testing, 7,204-yard links course. Ryder Cup stalwart Westwood has lost in three play-offs since his last tournament victory in 2007, while two-time U.S. Open champion Goosen is enjoying a career resurrection after disastrous seasons in 2007-08. Americans Jim Furyk (70) and Stewart Cink (71) are also in contention on one-under. Watson's bid is boosted by the fact that world No. 1 Tiger Woods missed the halfway cut, while defending champion Padraig Harrington is languishing back at nine-over as his bid for a third successive title faded with a 76 on Saturday.